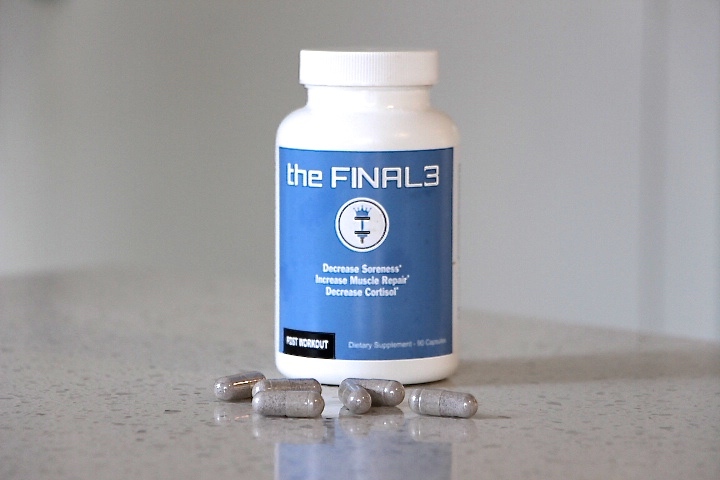 Product: The FINAL3 Recovery Supplement. Price: $49 USD (1 month’s supply). 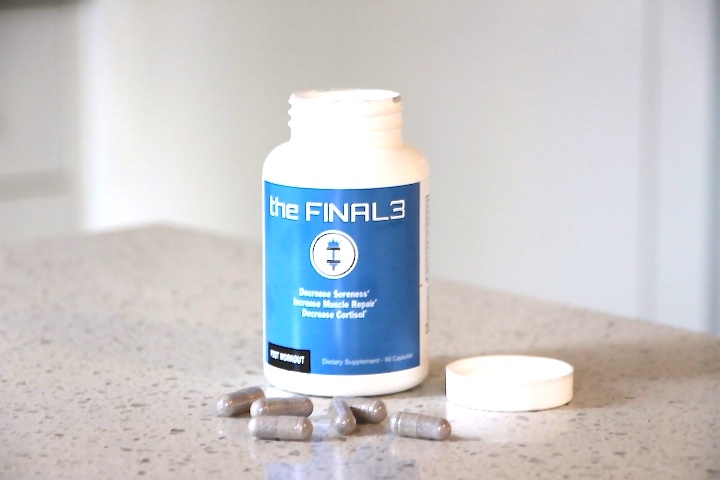 For those of you who haven’t heard of The FINAL3, it’s a relatively new supplement to hit the functional fitness market, with a huge focus on improving recovery after training. Its main aim is to help get your body back to normal to be able to return to training as soon as possible. After a tough workout your body is literally in shock and is craving nutrients and fuel sources to help repair its muscles. As a result it will experience inflammation of some sort and will also release glucose into your bloodstream to fuel it, which if unused, can be stored as fat. The FINAL3 is pretty much designed to fuel your body with the amino acids it needs after a workout, while also decreasing inflammation, and increasing muscle repair and growth. So how does the supplement do all this? The supplement is stacked with a bunch of amino acids to help achieve the three things stated above including Leucine, Isoleucine, Valine and bilberry extract. It also comes in a capsule form, designed to be taken immediately after a workout. Quality Amino Acids: Nowadays you can find amino acids everywhere. All kinds of supplements promote having some form of amino acids to help recovery and muscle gains. However, not all of these amino acids are of high quality, and designed to do what the supplement claims to. 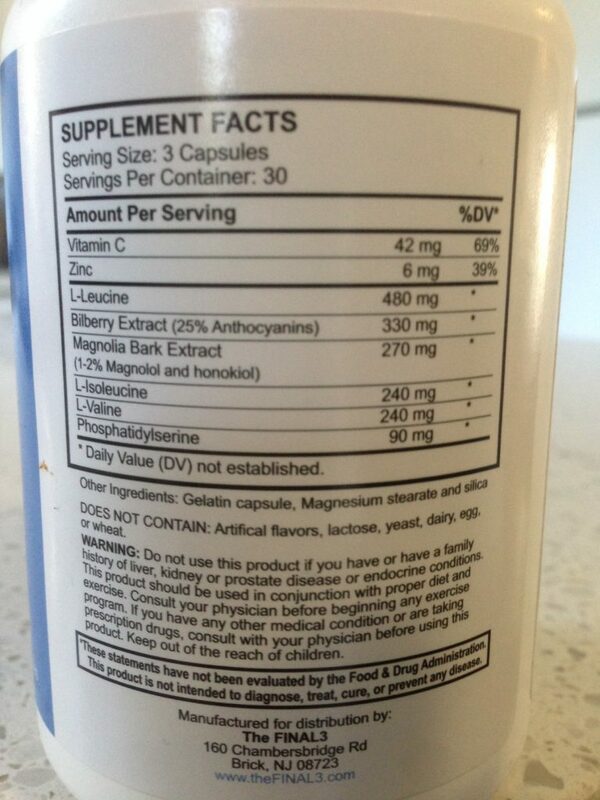 The FINAL3 contains a bunch of amino acids including Leucine, Isoleucine and Valine to name a few. Now these are all essential amino acids that our bodies cannot create on its own. It means we literally have to ingest this via powder or foods. The beauty about these amino acids is that they trigger protein synthesis and also inhibit the breakdown of muscle cells. So basically, they all work towards repairing your muscles and just as importantly preventing any muscle loss. Use of Bilberry Extract: Bilberry Extract is something we don’t see in too many supplements. But it is very effective in reducing muscle soreness by reducing inflammation. Several studies show that athletes who take bilberry extract after competing or training report substantially smaller pain increases. So going on that research, taking The FINAL3 after training will give you protection against acute muscle soreness and reduce the amount of pain you may feel the day after a tough workout. Reduction of Cortisol: One of the main aims of The FINAL3 is reducing cortisol levels. While cortisol is good for our bodies in small doses, and in certain situations, it can also work against us immediately after training. After stressful situations, like tough workouts, the human body increases levels of cortisol in order to release glucose in the bloodstream to be used as fuel. Straight after a workout it’s important we reduce these cortisol levels because if glucose is not used as energy, the body will just store it as fat. It’s also beneficial to decrease cortisol levels post-workout because it inhibits the uptake of amino acids into muscle cells. This makes it harder for us to fuel our muscles and allow them to repair and grow. Capsule Form: The FINAL3 comes in a capsule form. These capsules are a lot easier to take then powder forms, where you have to mix and blend into water. I’ve been taking several amino acids on and off for years and get fed up with having to mix and stir. The convenience of these capsules is definitely a positive. Endorsed by Athletes: The FINAL3 is endorsed by several functional fitness and CrossFit Games aspiring athletes. It’s always refreshing hearing leading athletes endorse a product before you buy and try. High Bio-availability: All of the ingredients in The FINAL3 are natural. Meaning your body can absorb more nutrients from the supplement than the other brands with artificial flavors, fillers, etc. FDA Approved: The FINAL3 is also manufactured in an FDA approved facility in New York. So you can be confident it meets all the necessary standards. Did it Work? : Like many supplements, it’s hard to determine just how effective they are, unless you’re conducting professional research assignments, which The Rx Review isn’t doing. After taking a month’s supple of The FINAL3, I find it hard to say exactly how effective it was. The short answer is, yes I did notice an improvement in my recovery. But how much of an improvement? I do believe that my recovery times were slightly better after taking the supplement directly after a tough workout. And I did find that times when I didn’t take it, I felt a little sorer and stiff the following day. That being said, don’t expect to be waking up the morning after a gruelling WOD feeling 100 per cent normal with no pain or DOMS. While The FINAL3 helps, it doesn’t completely eliminate all muscle soreness the following day. But really, that can’t be expected from any supplement. Price: A bottle of The FINAL3 costs around $49 USD. Each bottle comes with 90 tablets, which is one month’s supply. If you want to buy more for a discount, a three months supply (three bottles) costs you around $125 USD. While it is not an outrageous price by any means, it’s a little more expensive than some other recovery supplements on the market. Hard to Access Outside USA/Australia: The FINAL3 can be purchased inside the USA and Australia, but if you’re from outside those areas then it’s harder to find. The brand only ships to those two countries at the moment. Overall, the FINAL3 seems to live up to most of what it claims to offer. In my experience with the supplement I did notice slight improvements in my recovery after tough workouts, and also a reduction in inflammation in my body. I addition, I certainly didn’t lose any muscle size during the month I took the supplement, and if anything, my muscle size increased and my performance improved. That being said, don’t expect to take The FINAL3 and notice huge differences. I’m sure it will do a great job of reducing your recovery times etc., but how much, i’m unsure. In regards to its price, I do feel it’s a reasonable amount, and probably just for what you get. Sure, there are cheaper recovery supplements on the market, but I often find that the cheaper the product is, the less effective it is. For $49 USD a month, i’m happy to pay that amount if it means I can get back to training faster than I would without it.